They always say you should eat a rainbow with every meal. Since I know this realistically doesn't happen everyday, it's always exciting when I have some deep purple vegetable for some nice color flair! This dish was a huge hit at my family's Thanksgiving gathering, even amongst the picker eaters. Adding in sautéed onions and some apple cider vinegar really gave it a nice sweetness! Chop onions, core and chop cabbage. Heat oil on large skillet (medium heat) and add onions. Stir, and once onions are softer and more translucent, add the cabbage. Stir the cabbage and onions together, add more oil if desired. 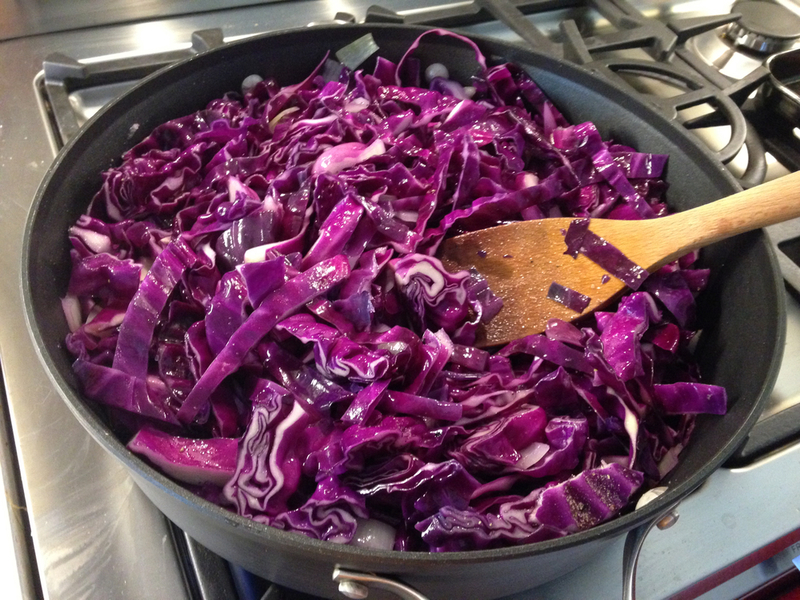 Once the cabbage has cooked down and softened (about 3-4 minutes), add the vinegar, salt and pepper. Turn the heat down to low/medium-low and stir some more. Let it cook for almost 10 more minutes. (Raw cabbage can cause gas in some people, so I try to make sure it's cooked thoroughly). Taste it, add more salt/pepper if needed. For more sweetness, add liquid coconut aminos (soy sauce substitute) OR balsamic vinegar, to taste.